As an Algebra teacher for special education students, I initially wanted to do a concept map on the different methods of factoring, as this is an area that is heavily tested on the NY Regents Exam and my students struggle with this concept. But honestly, my students struggle with most of the algebraic concepts. Abstract concepts are very difficult for them to grasp. I am constantly asked, “When will I ever use this?” and that’s a tough question because I know that none of my students will ever use the majority of this material again. My answer to this question has always been that I am not teaching them math. I am teaching them how to think, and problem solve. If I can get them to try to help themselves without immediately giving up, then I feel that I have done them some good. With this in mind, I created a concept map of places on the web they can go to help themselves when they get stuck. These are all great sites that I would like them to get comfortable going to with a problem. I use VirtualNerd a lot for flipping my lessons. The videos are short, concise and easy to understand. Desmos is our go-to calculator for homework as my students cannot afford a graphing calculator. The MathBits couple is amazing. They live near me, and I love to go to their workshops. They also are the brains behind regentsprep.org, a site that every NY teacher is familiar with. 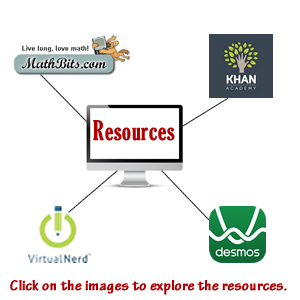 I am not as familiar with Khan Academy, but I have used some of the videos. I really liked the result of this assignment. Both the coding and the content flowed easily from start to finish, so I must have been on the right track! This entry was posted in 1.1 Creating, 1.2 Using, 2.1 Creating, 3.5 Ethics, edtech 502 and tagged concept map, edtech501, flipped classroom, resources.